Hi there! I’m Misti ‘Ridley’ Little—you can call me Ridley since this is a podcast about long distance hiking and that’s my trail name. Ridley comes from Lepidochelys kempii, the Kemp’s ridley sea turtle, my so-called patronus animal. I spent the summer of 2000 doing an internship in college capturing and tagging Kemp’s ridley sea turtles, a critically endangered species, and have loved them and other sea turtles ever since. Growing up I spent a few summer vacations visiting Florida with my family but it wasn’t until my fiance-turned-husband got into the Florida Institute of Technology in Melbourne, Florida for graduate school that we moved to Florida. We lived on the Space Coast from 2002-2004 before moving to Miami and Fort Lauderdale, where we lived until 2010 when we left the state. We returned to Texas briefly before heading out for Springer Mountain, Georgia to follow those famous white blazes of the Appalachian Trail to Katahdin in Maine. Our thru-hike of the AT began March 13, 2010 and concluded with a sunrise summit of Katahdin on August 11, 2010. From there we returned to Texas where we did an impromptu road trip to Texas state parks, visited family, and attempted to figure out what was next. 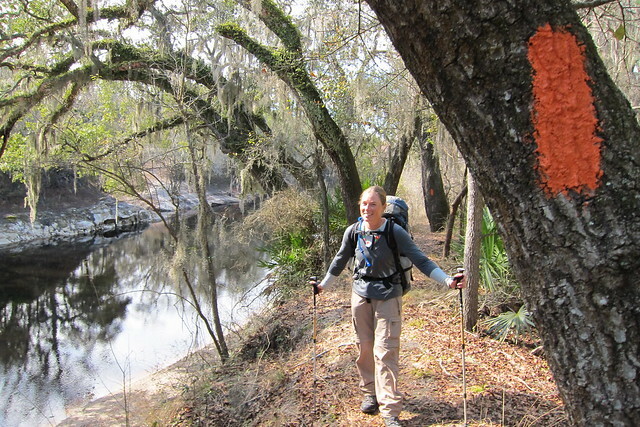 We rebuilt our bank account with some biological field work in east Texas and when that was coming to an end in December 2010, my husband Chris (Panther) tossed out the idea to hit the Florida Trail since we were still relatively unencumbered and fairly trail ready. We got everything together for another thru-hike and started out January 8th, 2011 heading northbound following the orange blazes off of Loop Road and finished with our friend Speaker, whom we had met on the AT, on March 3, 2011 at Fort Pickens. Chris and I still live in Texas, though we had a brief return visit to Florida in 2014 when I was about 12 weeks pregnant, and still miss Florida quite a bit. In Florida we were avid swamp hikers and very much into botanizing Florida’s native orchids, including documenting a previously unknown population of ghost orchids. Now, we live just outside of Houston on a little over an acre with pond frontage, have a 3.5 year old son named Forest, are avid gardeners, and find as many ways to get out and hike Texas’ trails when possible. Life is just a bit different than it was in Florida or when we were thru-hikers! Different but still wonderful! We work in environmental consulting by day and have many creative pursuits on the side, this podcast being one of them. I write regularly at Oceanic Wilderness and also host a gardening podcast, The Garden Path Podcast. Our love for the Florida Trail runs deep and I’m always frustrated when I see negative comments about the trail—it hurts my feelings just a bit! I know, I know, that’s my sentimental side speaking. More practically, as much as I love the trail and try to defend it I’m at a loss of how else I could support the trail while living in a different state. We’re active Florida Trail Association members, but being in a different state makes it difficult to get out and do any trail maintenance or volunteering. I did write a book about our hike but it is as of yet not published, though not from lack of trying to pitch to publishers. It’s difficult to get past the persona of what of Wild and A Walk in the Woods has done to the cultural thought process of what long distance trail hiking is—they are both great books, just not necessarily reflective of the experiences of most thru-hikers. Sometimes we just like to go hiking. Needless to say, that’s on hold at the moment while I reassess if or how I want to proceed. So, short of cheering people on via social media or cheerleading the trail through my blog or other outlets, there’s not that much else I could do. But, I could start another podcast. The trail has many voices: thru-hikers, section hikers, day hikers, casual use visitors such as birders and plant enthusiasts, hunters and fishermen, trail maintainers, volunteers, trail angels, and Florida Trail Association employees and board of directors. I want to showcase those voices that tell the stories of the trail through their experiences. 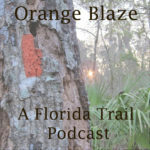 It’s easy to hear myths and misconceptions about the Florida Trail and I’d love for this podcast to talk about some of those, to highlight the wonderful aspects of the trail, and to allow the trail to inspire other hikers to come out and explore the Florida Trail. For now this will be a monthly podcast. Occasionally there may be two episodes a month. If you are interested in being on the podcast to talk about your experience with the trail, email me at orangeblazepodcast at gmail dot com or drop me an email via the contact form on the right hand side of the page. Let me know a bit about you and your experience with the trail as well as any links pertinent to the hike such as social media accounts or trail journals and blogs.